This year I have made a huge effort to shop all my christmas with local & small business. I tired of having "stuff" and instead I want memories and heirlooms. I want to support my fellow small business owners and buy quality over quantity. Let's start with Morgans on Main in Stanford Ky .... below is her sales Ad. As we speak the fabulous romper I have on in this photo is on CLEARANCE! so you better go grab it before you better believe my sisters and I will be there bright and early! Then head over to Soaps and Such just across the street where you can buy my favorite tree tea oil bar of soap! Soaps and Such have gift sets, blue bird gift cards and Red House hair pomade! Afterwards we will eat at the blue bird cafe and maybe ice cream at 4 generations where they also have gifts. I think theres a kids clothing store up the street and tomorrow Ill be exploring that to see what thats all about. Just around the sharp turn is the Standing Fort that also has some clothing and gifts! All that shopping with huge deals and you don't have to fight that big city traffic! Ok so now we are in Berea a wonderful little town to spend a day or two. The below photo is a shop called Appalachian fireside Gallery full of local art and made made goods. I bought several gifts already from here including a leather bow for willow a boho leather hair piece for my sister and an old fashion duck on a string that my daughter pulled all through the store and I couldn't not get it! I didn't think she would like such an old fashion toy but she did!! Lots of pottery and wood working in Berea. This store also sells my absolutely FAVORITE CHOCOLATE!! Laura's Hemp Chocolates made all local and vegan so its a great gift for vegans or people like me that eat healthy but want a little treat. Because every chocolate has hemp and pure cacao its full of anti inflammatory and Omega. My whole family eats they including my diabetic grandmother and we fight over the last bite so this year Ill be putting them in everyones stockings! You can buy them online but they are also in many stores across Kentucky! Danville Ky: Has a wonderful little boutique Called Vestiary to shop at I love the jewelry they always have something so bold and unique like the ear rings below and you can shop online! Louisville Ky: Flourishes with small business and is a great place to Christmas shop. One of my favorite boutiques right over the bridge is Colokial girly meets boho but still very unique. Black Friday and Small Business Saturday 40% of everything hummm hello what a great deal! Now we get to Ky Darling... My brand of antibiotic free no added Hormone pasture raised grain finished beef and kitchen sets. Im selling gift cards, beef, pork bundles, aprons, microwaveable reversible bowl cozies, hand wood burned spoon sets. 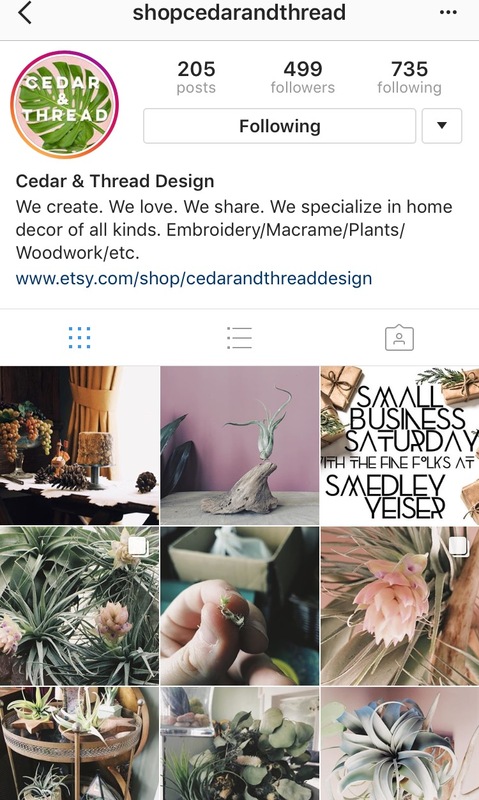 shop cedar & thread etsy shop for awesome air plants and other home decor made right here in Kyentucky!